Learning to park can sometimes be more challenging than learning to drive. It’s an important part of your drivers education. It is all about observing the reference points so you can determine what space you have to turn and maneuver without hitting any obstacles and to arrive centered in the parking space. Sounds easy enough right? Parking lots are known for having quite a few collisions due to the fact that there are so many people and drivers in a small space. Experience makes perfect in this area. Here are some tips to help you become a master car-parker. When you move slow while parking, it allows you to have greater control. Turning quickly helps to position your vehicle right where you need it to be. While it’s common to look to your left and right, you must remember to look directly behind you when back up as well. An opposed vehicle could be backing out right across from you or a pedestrian could be strolling by. Even in an empty lot, you cannot assume that a car, pedestrian, or cyclist won’t be there. You don’t need to park way out in Timbuktu, but it’s easier and safer to park where other cars are not packed all around you. 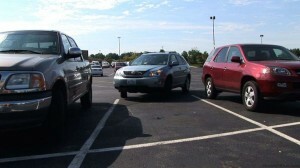 Remember that carelessly backing up is the greatest cause of parking lot collisions. Be alert, drive slowly, and check all around you when backing up and parking. This entry was posted in Top Driver Blog and tagged 4 Quick Tips, Learning to Park, Parking Car, Parking Tips, Quick Tips to Park Your Car.